It’s a powerful spectacle to witness: a ceremony in a Nepali village, where girls as young as 10 perform a stage play and give speeches on child marriage or domestic violence. These are the issues they and women from their communities face on a daily basis. Last week, over 150 Her Turn alumni led such ceremonies in three villages of Sindhupalchok district, while their parents and teachers marveled at their public speaking and advocacy skills. Her Turn tries to answer these and other risks rooted in patriarchal social norms. 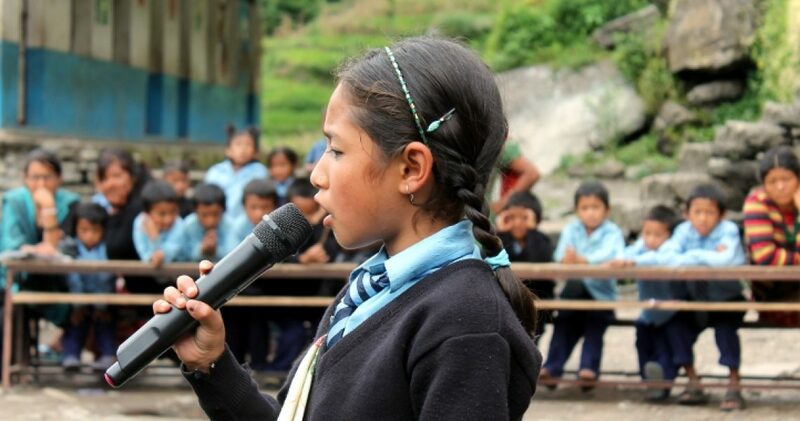 Our keywords are: educated, empowered and equal and our aim is to bring these values to Nepali villages. Our program consists of four weeks long workshops for girls from public rural schools. The curriculum first covers the basics: the issues of health (puberty, nutrition, menstruation management) and safety (bullying, discrimination, domestic and sexual violence, human trafficking and child marriage). Next, it focuses on developing confidence, advocacy and leadership skills. During the final week, the girls decide by consensus and implement a small community project – which can be anything from installing bathroom dust bins and door locks (an important factor in girls’ school attendance), to purchasing sports equipment, books for the school library, sanitary pads, or a small sound system. The workshops are led by local female trainers, of which many come from low caste backgrounds. Majority of them speak indigenous languages such as Sherpa or Tamang, which is helpful to many of our younger participants, whose mother tongue is not Nepali. The curriculum is child centered, interactive, and fun. We emphasize the importance of education and we practice team work and inclusion. The attendance rates above 99% suggest that the girls thoroughly enjoy the workshops. Girls in Nepal are often seen as shy and passive. Child marriage rates here are at staggering 41%, and in some of the villages, almost all women are married off before they reach 18, sometimes as early as 13. They all experience the devastating health and social consequences of early marriage. In our program, we try to combat these perceptions and show alternatives for their futures. Her Turn proves to the girls themselves and their communities, that they can be powerful advocates and agents of change. Our alumni learn how to protect themselves from this prevalent practice, and other harmful traditions. In each school, the girls form a Girls Support Committee that serves as a resource for all the students. The committee is equipped with a guide that includes information on local women police cells, women’s groups, and NGOs and the legal frameworks regarding various forms of gender based violence. So far the reception from schools, communities and, most importantly, girls, has been promising. The trainers report that the girls start speaking up, playing soccer with the boys and become more confident. The parents, families and community leaders are surprised to witness their daughters advocate for their rights during the community ceremonies. While challenging the patriarchal social norms is a complex and delicate process, we see that for these girls Her Turn is a step in the right direction. All of above quotes come from Her Turn alumni.